Warner Bros. Interactive Entertainment has launched Batman: Arkham Origins worldwide today on PC, PS3 and Xbox. This video game features an “action packed” story featuring “visceral combat” in an expansive Gotham City setting. 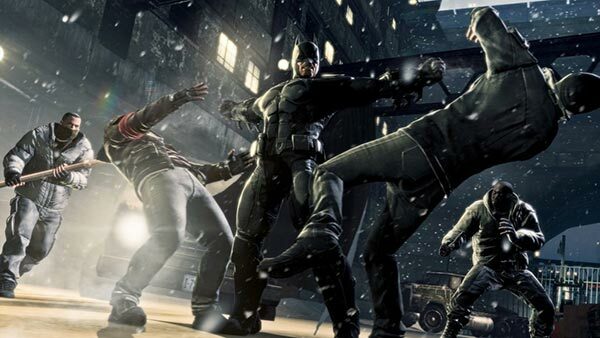 In the game you will play as Batman and fight against arch baddie ‘Black Mask’ and eight deadly assassins. In Europe, if you want to buy a boxed copy of the game for PC or Wii U, you will have to wait until the 8th November. But it seems to be downloadable on PC right now here in Blighty. Batman: Arkham Origins is a prequel to Batman: Arkham Asylum and Batman: Arkham City and the action takes place several years before those two games. This game features the origination of Batman, from before the rise of the most infamous bad guys in Gotham City. In this game your character is “a young, raw, unrefined Batman as he faces a defining moment in his early career as a crime fighter that sets his path to becoming the Dark Knight”. The 17-minute walkthrough of the game, above, gives you a very good feel for the game and its environments and is hosted by Senior Producer Ben Mattes and Gameplay Director Michael McIntyre at WB Games Montréal. Looking at computer game specialist magazine reviews, many say the game is enjoyable but lacks the polish of the previous two games. Most reviews I looked at gave the game a pretty decent 4/5 stars. Game Informer wrote that while the game “doesn't break new ground,” it “still puts on a hell of a show when it needs to”. IGN likened the Batman games to pizza; “even when they're not very good, they're still pretty good.” Also, while this new outing is a little disappointing, “as excuses to dive back into the excellent free-flowing combat and predator takedowns go, this story isn't bad.” Gamespot summed up that the new game “gives you exactly what you'd expect in another Arkham game, without doing anything to push the series forward,” and the reviewer was the most negative about this “routine rather than inspired” game, of all those I checked out this morning. Many HEXUS readers will recognise this new Batman game as an Nvidia ‘The Way It’s Meant To Be Played’ title. If you are thinking of upgrading your system with an Nvidia GPU and fancy this game please remember that it is available in the soon to launch GeForce GTX Holiday Bundle alongside Splinter Cell Blacklist and Assassin's Creed IV: Black Flag - depending upon which graphics card you purchase. Graphics look good and I enjoyed the other games. Well I will see soon, downloading at the moment, even if it is a staggering 26GB download! Really? Its only 16GB on my machine? I wonder if it reuses some resources from city?